Packaged as a “single pocket sports belt” this black elastic belt is 1-1/2” wide, and adjusts from 27” to 43” but will stretch to up to 60”. Closes with a molle buckle. In the middle is an 11” long zippered pouch that folds flat under the belt but unfolds to approx 3” wide, and will expand to almost twice that. Big enough to hold a large smartphone, keys, wallet or a bunch of cash. 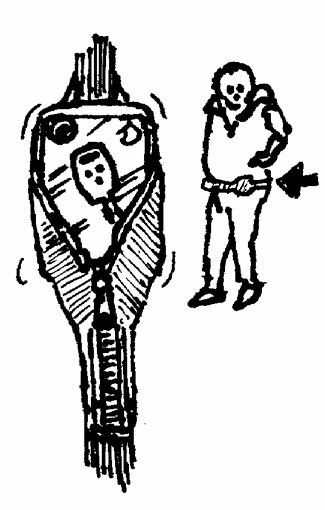 Handy for runners or travelers. Or running travelers. Or traveling runners. This isn't a book, but it's definitely book-ish. 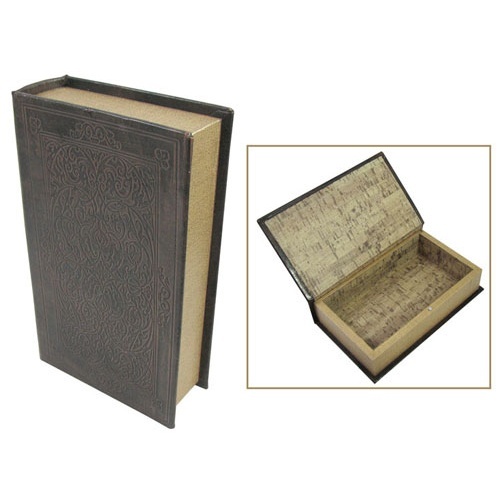 Looks like a leather-bound volume from the Bodleian but it's just a little wooden box, approx 8-1/2" x 5" x 2" (7" x 3-7/8" x 1-5/8" inside) that's perfect for stashing the jewels, cash, or whatever you need to stash in plain sight on the shelves. "Laser" safety lights each with super bright LEDs run by (2) "AA" batteries that you supply. It's square and has a flashing or steady LED lamp visible up to 2500 feet (distance may be exaggerated). A 2" x 2-1/2" red plastic reflecting lens covers (3) lamps. Hook it on your belt or pack with the belt clip, use the included elastic strap for arm or leg mounting, or the included aluminum flange to attach it to your bike.. 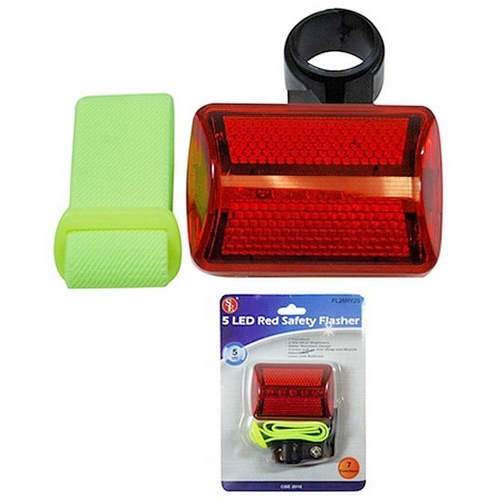 It's great for general use as a warning device or as an emergency signal for roadside breakdowns. 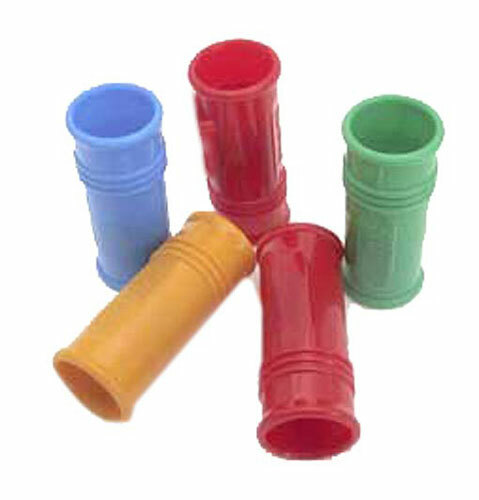 This well-made plastic siren/whistle, a touch over 3/4" in diameter and a similar touch under 2" long, has a perforated metal disk that rotates in response to a silent blast from the perpetrator's lungs. This creates a high-pitched, loud and certainly distinctive siren-sound that picks up pitch in relation to the air velocity, sustains it as long as your wind holds out, and winds down quickly thereafter. A fine way to signal your arrival or departure. Probably not loud enough to collect the clan at the beach, but loud enough to get their attention in the classroom! The size makes it hard, but not impossible, to swallow, so please use care in teaching youngsters to sound like a miniature air raid siren. Another iZoom® twofer. 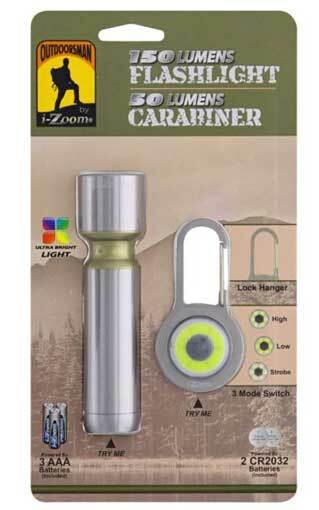 Our each is 150-lumen silver aluminum COB LED flashlight, 4-1/3" x 1" dia, and your bonus is a carabiner key chain with a 3-mode LED light in the center. Push-button switch makes it bright, strobe or really bright. Oh, those COBs!